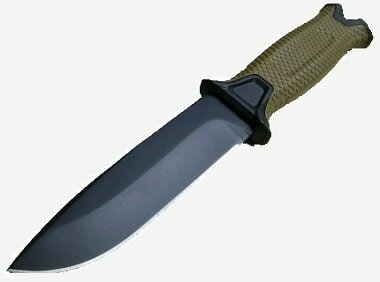 The basic hunting knife is exactly that: a general-purpose field tool that hunters carry as opposed to those carried by military, or outdoor survival type individuals. The hunting knife will see most of its work when field dressing harvested animals in the hunt. Lacking a good quality hunting knife can mean the loss of valuable meat, trophy capes, and even just the pure misery of working with a dull, cheaply made tool. During my 40 years in the field hunting big game several times a year, I have seen the general-purpose hunting knife both fail and succeed. 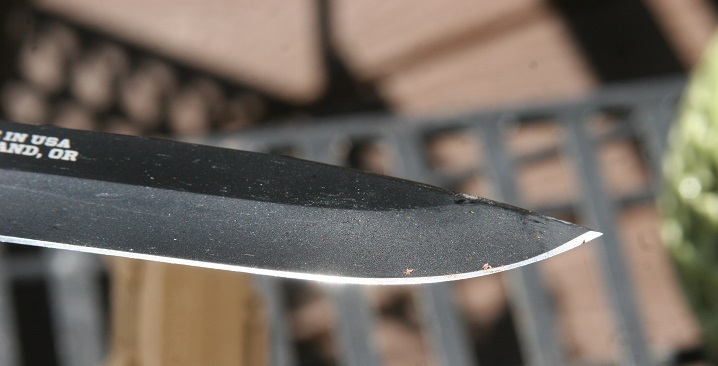 When a knife fails to respond, it is not a very pretty sight to be sure. 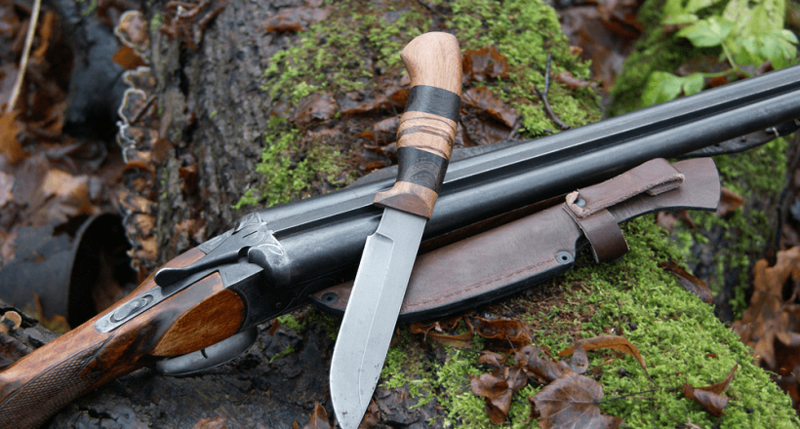 Designed with a clip point blade and razor sharp, this knife has an ability to retain a good edge even when larger game animals are being field dressed. 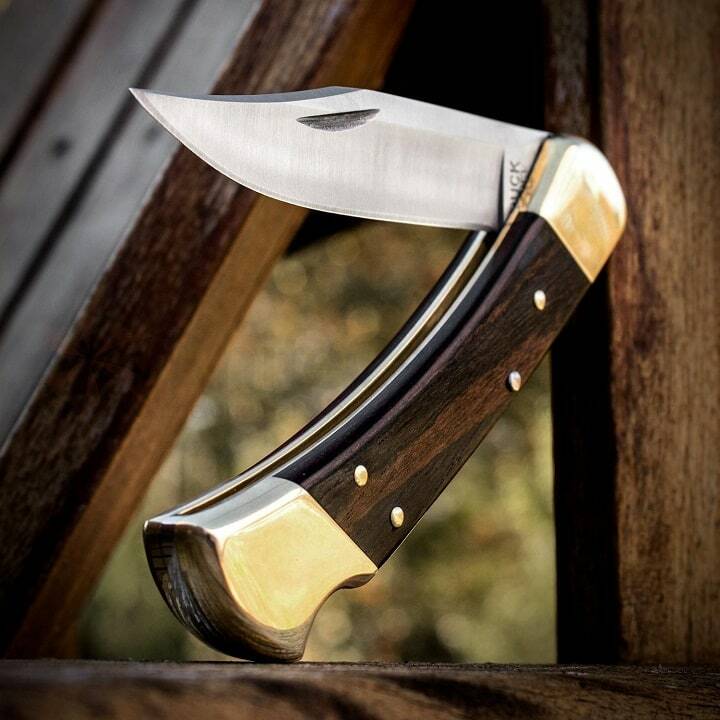 Carried in a strong leather snap type sheath, the Buck Folder is among the most popular knives carried today. It is light weight, folds to under five inches, and makes for a great field tool when every ounce your carrying counts. The nail notch on the blade makes it easy to open, with the grip-mounted lock back feature guaranteeing that the blade will not collapse when making a cut. Offered with a classic walnut handle and pure brass bolsters, the knife is not only functional but a thing of beauty as well. I have carried my Buck Folder for over 40 years, it is dull flat in color, grayed grip wood, and some scratch marks on the blade from working it over with a stone. However, this tool is every bit as good as the day I bought it in my local hardware store back in the 1980s. 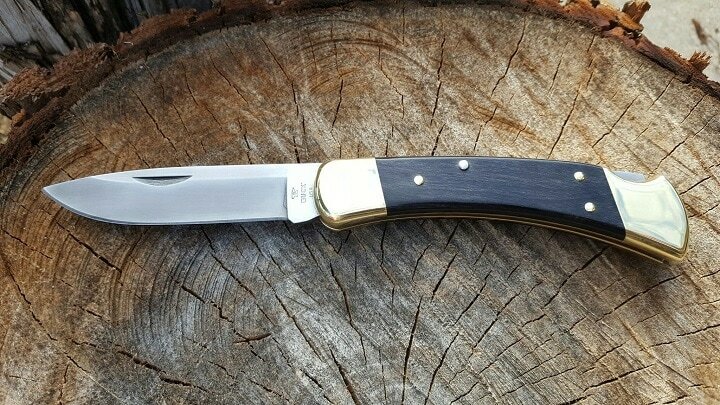 This Buck knife 110 being made in the USA carries a FOREVER WARRANTY, and I doubt you would ever need to send one back even when used under the harshest conditions. The price of Buck 110 Hunting Knife varies, so check the latest price at Amazon. 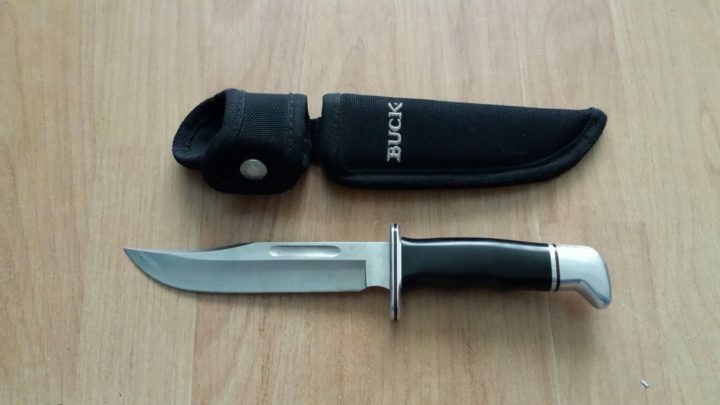 I can honestly tell you that I miss my Buck 119 Special Fixed blade hunting knife. I have owned two and both have gone missing in or near hunting camps. I think the knife gods have something to do with this, and Buck knives must be in short supply over there, or wherever they ended up. The 119 will be replaced again because it is that darn good a system when taking apart a big mule deer, or cutting through a 10 foot gators tail in preparation to feed a hunting camp of ten men. How do I know this? Because I have done just that with a Buck knife in the past. 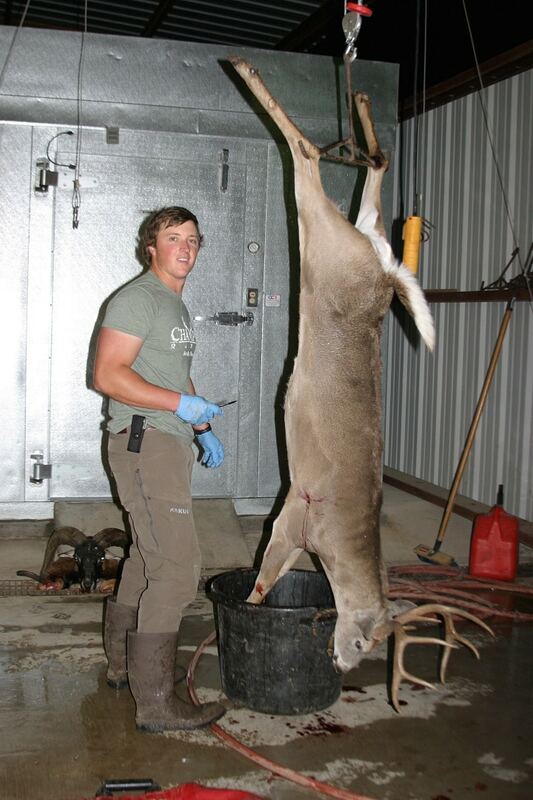 A guide at Champion Ranch in Texas field dressing a whitetail buck shot by the author for freezing and later photos. Again, note the size of the knife being used here. Being the 119 retains a palm swelling grip surface the knife is easy to control even when working blind inside the gut cavity of a large animal. In this case the blade is ideal for large mule deer or whitetail dressing. This knife has a life time warranty. 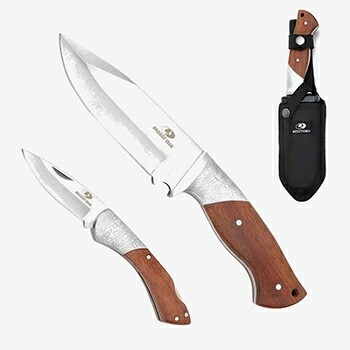 The price of Buck 119 Knife varies, so check the latest price at Amazon. This Buck is a heavier knife with a drop point blade that can carry extra strength for tough bone cutting and field dressing work. 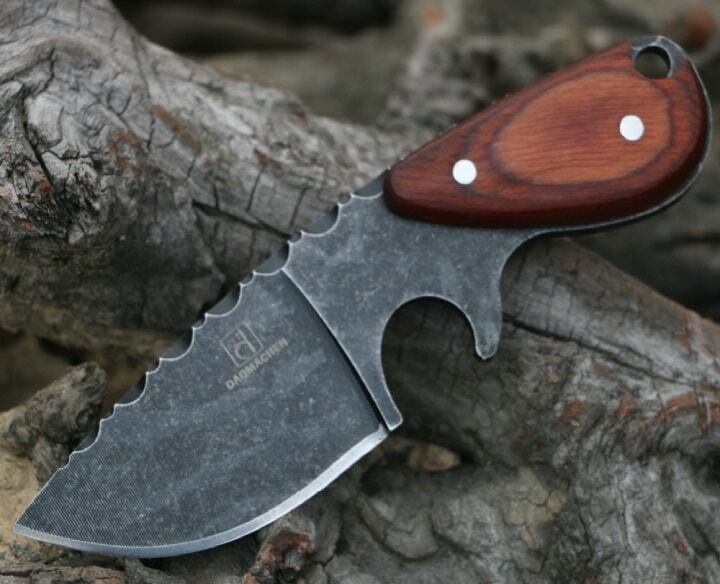 Built as a full tang knife with finger integrated finger guard for controlling the knife surface when cutting in slick blood areas, or any need for very positive control, makes this a natural for serious big game hunters as a field carry tool. 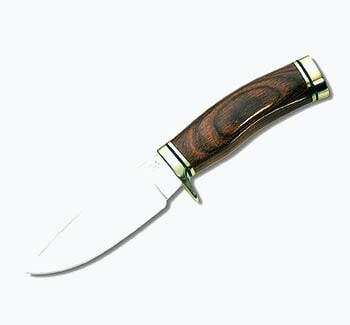 The knife carries a 4.1/8th inch blade an overall length of 6 inches. 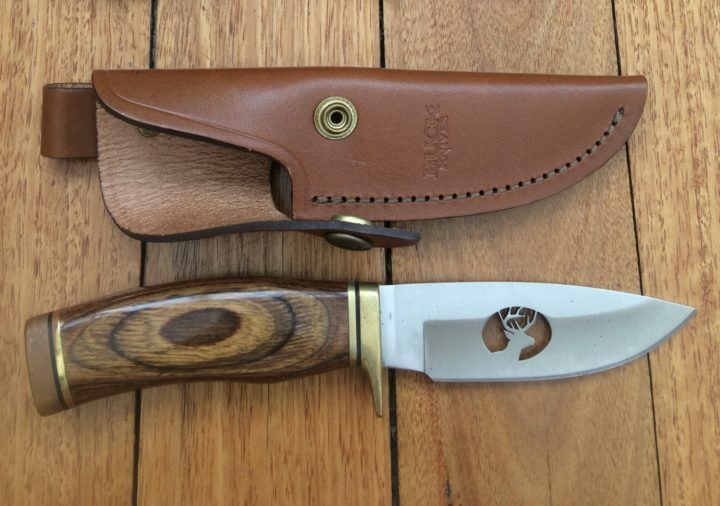 As in all fixed blade knives from buck the knife is retained in a very heavy leather snap closer sheath. This total package is designed for the field by the hunter. 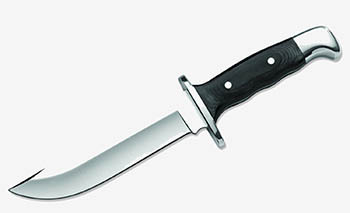 The price of Buck Knives 192 Knife varies, so check the latest price at Amazon. Here we have a pair of knives being offered as a kit system for field dressing. Why two blades you ask? Because there are times when a smaller knife is an advantage during field dressing work. For example, deboning meat from smaller bones of the animal, when hunting back country that involves a processing job right in the field and into carry bags for a trip off a mountain or prairie setting. Big knives are generally made for big work details such as primary breaking down an animal, in most cases detailed cutting work is done back in camp. The large blade in this set has a gut hook that can be a very welcome when slitting down very large animals and the hunter wants to maintain good control, for example, not cutting into the gut, but working a cut right at the upper side of the gut sack. 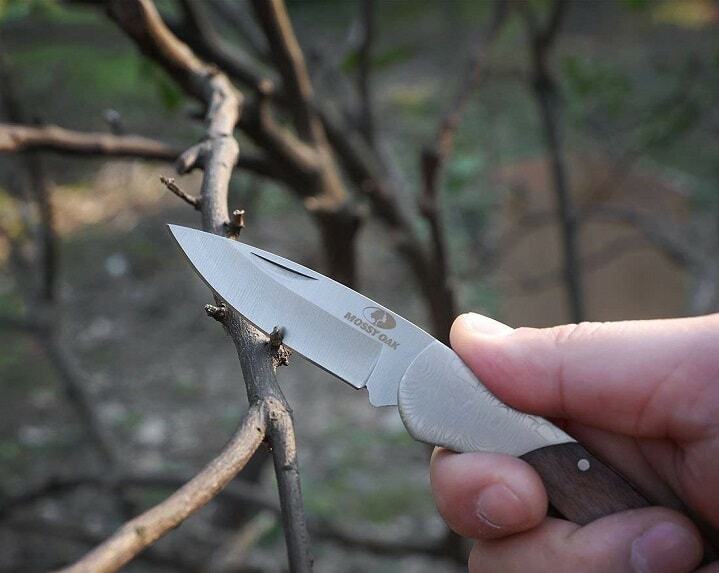 Built as a full tang construction system, these knives are designed to work hard in the field. The blade surface is glass bead blasted, and tend to keep a good edge for long periods of field use. Sheath construction is heavy black nylon with snaps as closers. 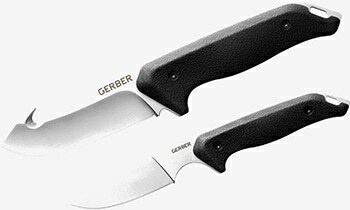 The price of Gerber Moment Knife varies, so check the latest price at Amazon. Now I am evaluating the StrongArm fixed blade knife, with great results so far. This 5 inch knife retains a nice drop point blade, is soft enough steel to clean up with a stone or steel and retains heavy composite handle. 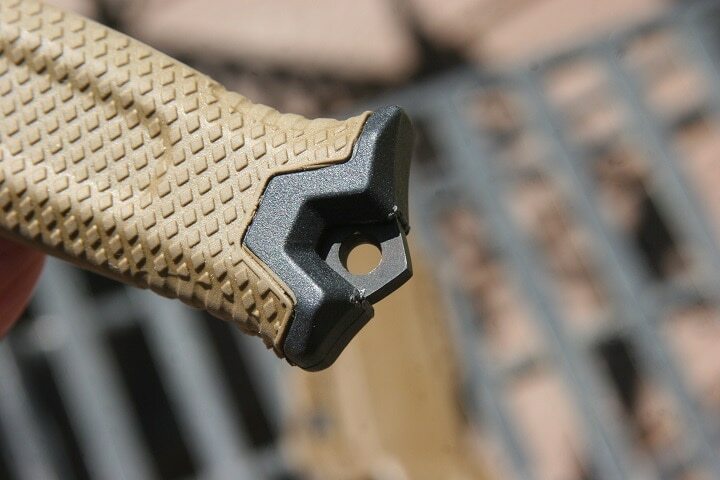 Hand protection is designed into the hilt in case it has to be used for self-defense, and a good grip for slippery conditions when field dressing. Also, the heavy knife blade can cut or crack bone if required. 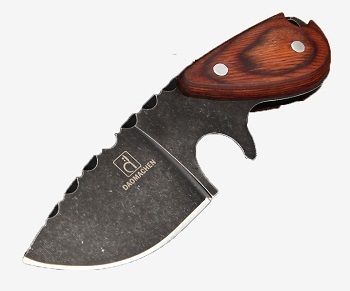 This blade is available through the Hunting Mark online store. 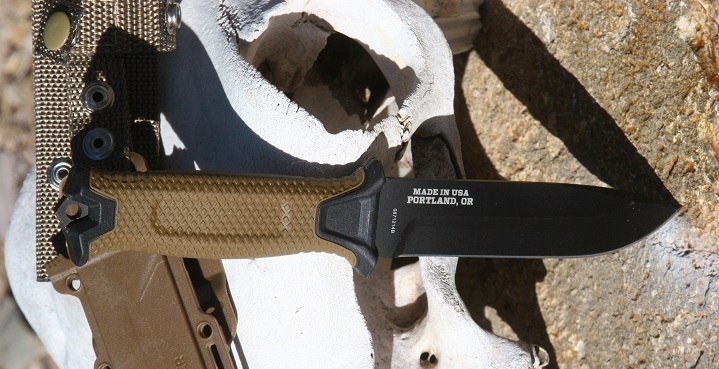 The knife has a combat style field sheath that matches the handle in a ‘Coyote Tan’ color. The textured soft rubber like surface is an additional control system that this knife retains. The bottom line is that I like this tool a whole lot, and when asked to field test some of Hunting Mark store’s products this was a requested knife for that review by me. So far, I am not disappointed at all. In the past week, while I was guiding on a trout/pike combo fishing trip in the Black Hills of South Dakota the knife took on several big fish and prepared them for the grill in short order. Not a fish knife, but a jack of all trades field knife and a solid substitute for a specialized blade. 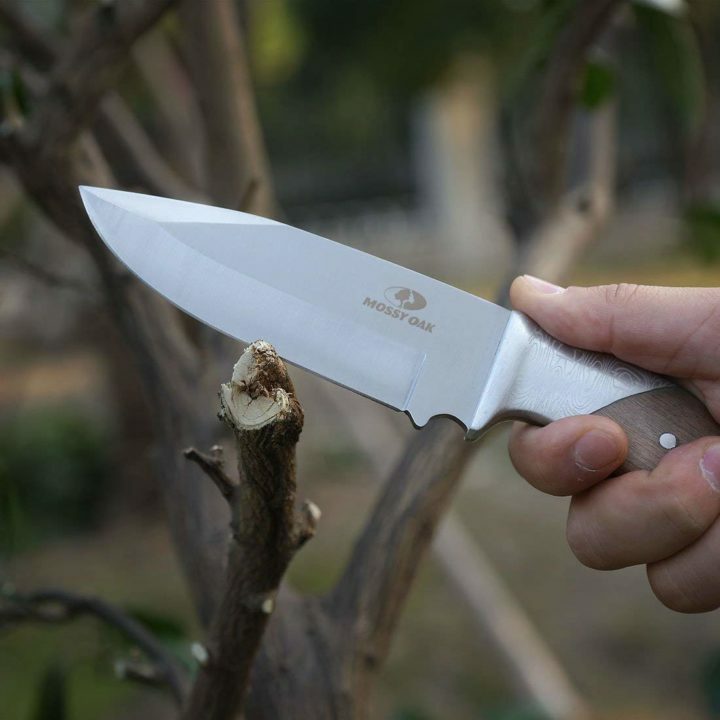 Made in Portland, Oregon, this blade is an all-American product with full backing. The price of Strongarm varies, so check the latest price at Amazon. 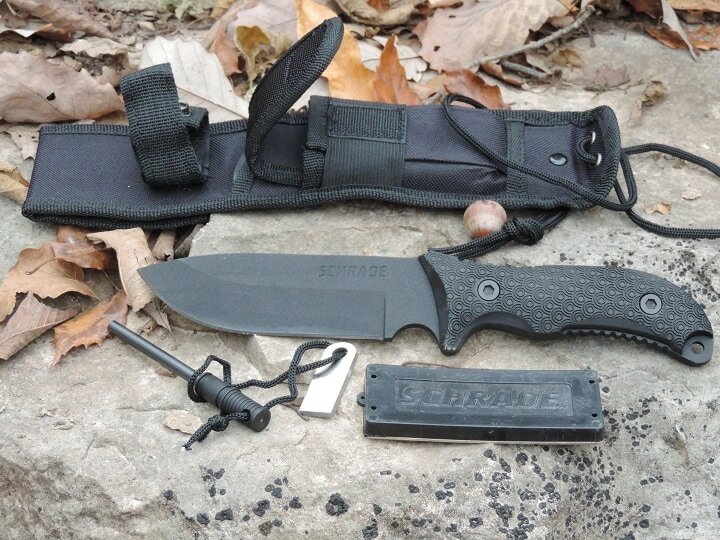 This Schrade knife is a good hunting and general-purpose field knife. 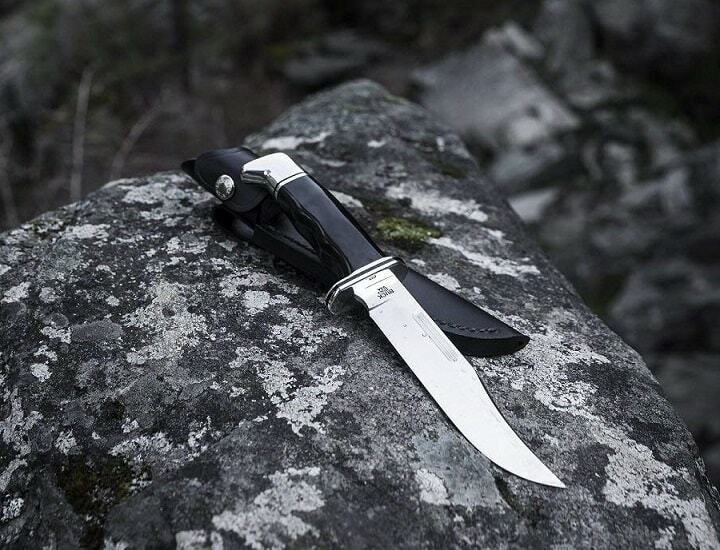 Schrade is a solid brand name so can be trusted if an issue should arise. While not priced off the wall at around $30, this 1095 carbon steel knife will take to a sharpening steel very well and is sure to outlast the user. 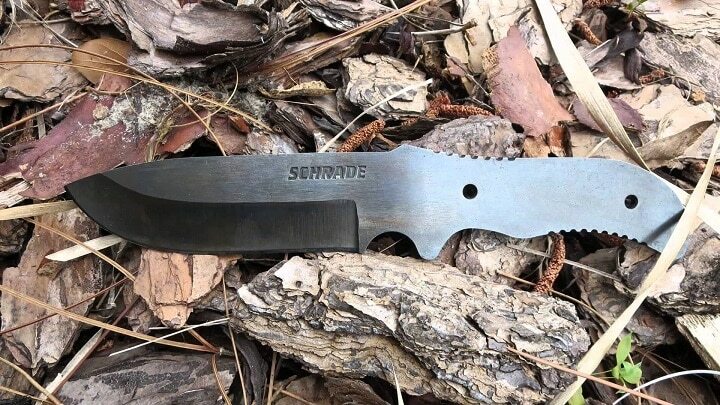 Schrade has indicated that the knife comes with a ferro rod, sharpening stone and striker, and retains a retention lanyard hole at the end of the handle. 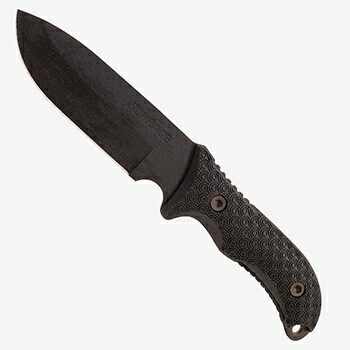 The grip surface is made with a black ring textured handle and a slight hilt angle to help keep the hand stay steady. The price of Schrade SCHF36 varies, so check the latest price at Amazon. 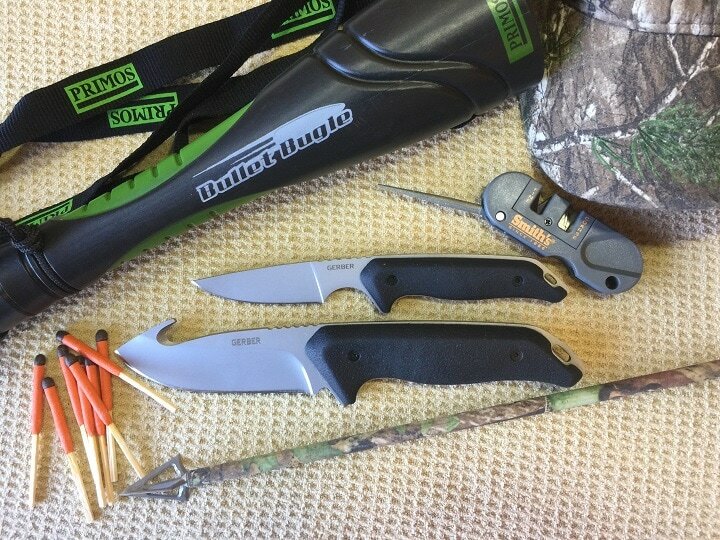 Mossy Oak has designed a field dressing knife for big game, small game and even turkeys and waterfowl. While the big 5.25 inch blade drop point design takes care of deer-sized critters, the smaller folding blade drop point is useful for rabbits, coyote, or that prized trophy gobbler that got tipped over in the big woods. This folding blade is a total of 2.75 inches, with a 4-inch overall length. 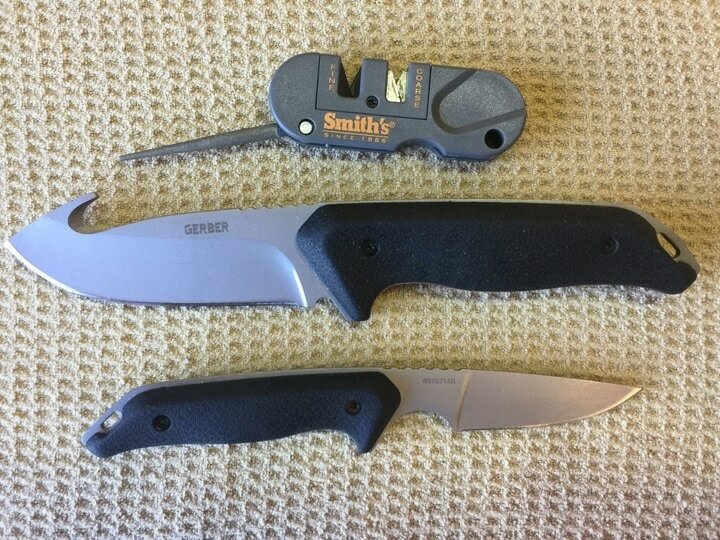 This knife retains a sold back lock system to prevent the knife from folding into the hunter’s hand when in use. The handles on both blades are made of both wood and steel and have a nice laser-produced Damascus pattern. The blades are made from 3Cr13 high quality stainless steel. At a budget price and with free shipping, you won't have to go see a therapist if you lose it! The price of MOSSY OAK varies, so check the latest price at Amazon. 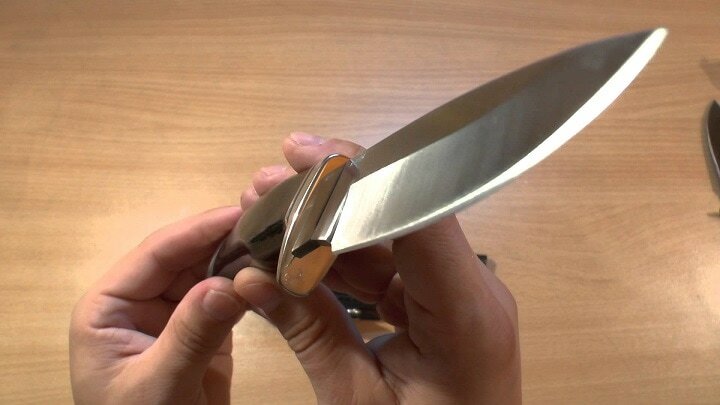 At a full length of 15.5cm this small compact knife still carries a 6.8cm blade with a width of 4cm. Made of 5CR13 steel, a common type used for general purpose knives, the blade will work well on stone or steel. The metal surface is stone washed with a wood handle. The knife comes with a solid sheath that is designed for belt ware. 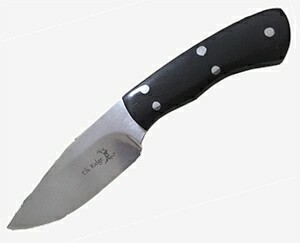 This knife is very workable as a pack knife or in any situation where excess mass is a problem. 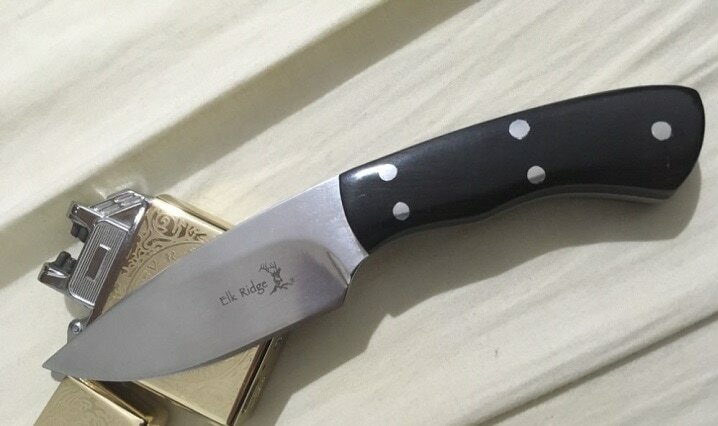 The Elk Ridge hunting knife measures 7 inches with a drop point blade design. With a wood handle using brass pins, the full-length blade and handle turns this knife into a strong cutting tool. This is a good blade for general big game dressing, or even work around a camp site with the blade material a 440C steel at a 58 HRC hardness level the knife will withstand the test of time. The price of HM Elk Rider varies, so check the latest price at Amazon. Any questions or thoughts about this review please let me know. We are happy to hear both positive and negative feedback. Of course we don't know everything, but for the most part we have a solid working knowledge of the subject discussed. Any thoughts are always welcome.